Guernsey FC beat Carshalton Athletic 2-1 in their opening home game of the season to make it two wins from two in Isthmian League Division One South. 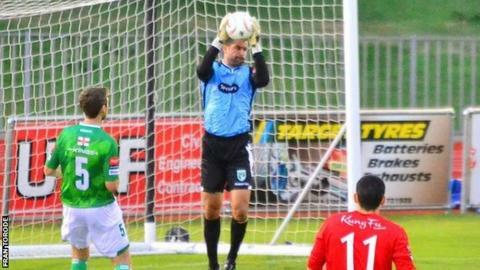 Matt Loaring gave Guernsey a 17th-minute lead before Ross Allen doubled the advantage shortly after half-time. But the Green Lions were indebted to goalkeeper Chris Tardif as he made a number of crucial saves, while the visitors also missed a penalty. Kingsley Aikhionbare pulled one back with 20 minutes left to Carshalton. But coach Steve Sharman, who was taking the team in the absence of Tony Vance, says the Green Lions must improve if they are to be a force this season. "We'll take the three points, but as a group we weren't great," he told BBC Radio Guernsey. "We didn't look after the ball. "You need to have a desire to go and win the game and in this league any team you play against is going to be completely up for the challenge. "We showed our ability really sporadically. I'm happy that we've got three points, but I can't take another 42 games of that." But Sharman was full of praise for former Portsmouth and Oxford United goalkeeper Tardif, after he kept them in the game. "At times he showed his unbelievable class," said Sharman. "I'm not sure at this level there is a better goalkeeper one-on-one. "Everybody has to play their part and tonight it was Chris's turn, he is so important to us."